’19 RANGE ROVER VELAR SVAutobiography: DYNAMIC! 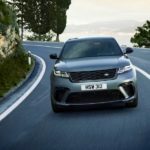 BREAKING COVER: RANGE ROVER VELAR! RANGE ROVER SENTINEL: LOCKED & LOADED!